Celebrating the life of Clyde J. Brown Jr.
Obituary for Clyde J. Brown Jr.
Clyde J. 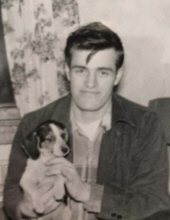 Brown Jr., 82, of East Vandergrift passed away April 3, 2019. He was born October 7, 1936 and the son of the late Clyde Brown and Kathrine (Johns) Brown. Clyde was once employed by Republic Steel Company and retired as a Coal miner from Brownstown Coal Mines in Leechburg. He was a great friend who loved to make people laugh and had a stubborn personality who insisted on doing things his way. Clyde loved spending many hours building his home, gardening, and mowing at his property in Kiski township. In addition to his parents he is preceded in death by his brothers George and James Brown and two grandchildren Andria and Cassandra. Family and Friends will be received on Saturday April 6, 2019 from 12:00 to 2:00 pm with a service at 2:00 pm at The Janette L. Gamble Funeral Home Inc. 2842 River Road Vandergrift, Pa (724) 567-7006 with Pastor Rick Gamble officiating. In lieu of flowers donations may be made to the family. Online condolences may be made at Gamblefh.com. To send flowers or a remembrance gift to the family of Clyde J. Brown Jr., please visit our Tribute Store. Family and Friends will be received on Saturday April 6, 2019 from 12:00 to 2:00 pm at The Janette L. Gamble Funeral Home Inc. 2842 River Road Vandergrift, Pa (724) 567-7006. Family and Friends will be received on Saturday April 6, 2019 for a service at 2:00 pm at The Janette L. Gamble Funeral Home Inc. 2842 River Road Vandergrift, Pa (724) 567-7006 with Pastor Rick Gamble officiating. "Email Address" would like to share the life celebration of Clyde J. Brown Jr.. Click on the "link" to go to share a favorite memory or leave a condolence message for the family.